Ely Buendia, the former frontman of the Eraserheads, says that holding a reunion for the popular band of the ‘90s is still far from his mind. His current band Pupil is nominated in the third MYX Music Awards. Six years after separating from the Eraserheads, Ely Buendia is still not open to the idea of meeting with his former bandmates. The singer-songwriter maintains that he is happy and content being the frontman of rock band Pupil, which released its album Wildlife last October 2007. Last March 6, PEP (Philippine Entertainment Portal) talked with the rock artist during the bar tour organized by MYX music channel. Ely performed with his band at the Mag:net Café on Bonifacio High Street, Bonifacio Global City. With the breakups of Rivermaya and Orange & Lemons, do you think this is a trend or is it inevitable for bands to disband? "I wouldn't call it a trend. Pero tama ka dun, hindi talaga maiiwasan na ganun. All good things must come to an end. I guess ‘yong time ng Rivermaya with Rico Blanco is over and I'm sure both artists—Rico Blanco as a solo artist and I heard Rivermaya is doing very well with the new vocalist. I wish them all luck and more power." Do you think holding a reality show is a good way of choosing a vocalist? "It's never been done here before. I'm sure the fans of Rivermaya enjoyed that. Kanya-kanyang trip lang naman ‘yan, e. Once that they found a suitable replacement for Rico and I'm sure that they did find him, that's all good." Do you miss anything about your former band, the Eraserheads? "Wala akong nami-miss. I'm very, very satisfied with this band [Pupil]. Marami kaming nagagawang okay. I think matagal pa ang buhay ng bandang ito dahil pare-pareho kami ng trip. At dahil marami kaming fans na sumusuporta sa bandang ito, I'm sure we will have a long life. I'm looking forward to doing more things with Pupil." What is keeping Pupil busy nowadays? "We're doing shows and promoting the album [Wildlife]. Basically, taking things a day at a time, waiting for the right projects that will interest us and challenge the band. We've just done a show abroad...in Qatar. Masaya yung experience na yun for us. Maraming Pinoy ang nanood and it was very, very enjoyable." Are you open to the idea of having a reunion with the former E-heads? "I don't think so. No, I'm not open to it now. Medyo malayo pa sa isip ko yung mga ganung bagay." It will be remembered that Ely was rushed to the hospital last January 2007 because of a heart attack. He underwent angioplasty to clear his blocked arteries. PEP asked Ely regarding his health. He says: "Okay naman. Binabantayan ko pa rin siyempre. I don't want to go through that again. Hopefully, hindi na maulit ‘yon." What changed in his lifestyle after the heart attack? "Siyempre, wala nang bisyo, pero nahihirapan ako sa pagkain. Mahirap kontrolin ang pagkain. Mahirap talaga mag-diet. Halos wala na nga akong makain na masarap. Yun lang ang kinalulungkot ko," says Ely in conclusion. The band Pupil is nominated for the category Favorite MYX Live Performance along with Gloc 9, Jed Madela, Regine Velasquez, Piolo Pascual, and Sugarfree. Click HERE to see the list of nominees for the third MYX Music Awards. The voting period is only until March 10. Tune in to MYX 24/7 on Skycable Channel 23 for the latest updates in the MYX Music Awards. 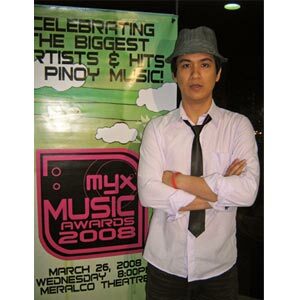 The MYX Music Awards will be presented at the Meralco Theater on March 26 (Wednesday).